What is the first thing you see when you walk into an acute-care hospital room? The first thing we notice is the big, white, worn out dry-erase board. Technology has come a long way, and so has Lincor’s software. Whiteboards are an outdated thing of the past. Patients want real time data, and your staff wants a more efficient way to connect with them. Lincor provides that with MyCareboard. MyCareboard is Lincor’s answer to the antiquated way patients and hospital staff communicate. MyCareboard is a cross-platform whiteboard that employs the latest technology in patient engagement software. 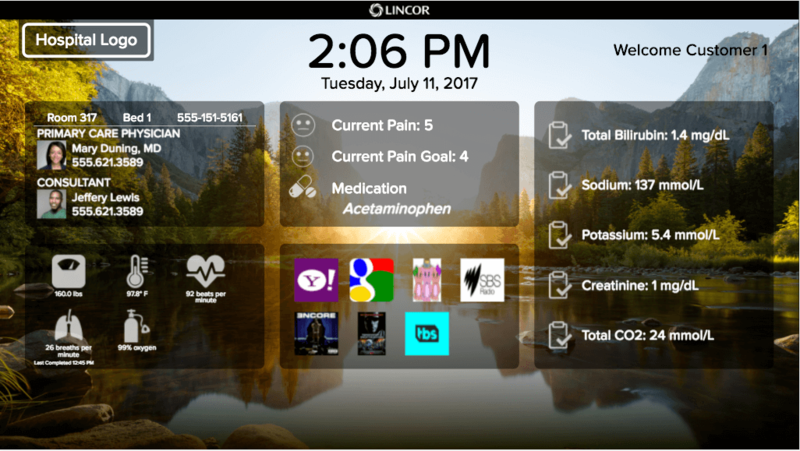 Lincor can easily connect your patients and your clinicians at the point of care through various focused applications called CareQs. Lincor has over 22 CareQs to fit your facilities custom needs, including 8 interactive Qs and 13 visual Qs. The CareQs can be mixed and matched to fit your custom needs. Purchase only what you want and leave the rest. Lincor can also connect directly into your hospitals EHR, and we handle the implementation and instillation. The time is now to modernize your patient rooms with the latest in engagement technology. Once implemented, your facility will experience better clinical outcomes and lower readmissions, while improving your overall patient and staff satisfaction.